This demo script you can download the sample code along with table structures � data at the end of this file in zip format. How dropdown list with Ajax script works? There are three files used in this tutorial. main.php : Display the category listbox and posts Ajax request. dd.php : Receives cat_id and collects matching subcategory from table. mainck.php : Collects the form data and display the same. This file first displays a form with three elements, one textbox and two dropdown selection boxes. One Test box is there as part of the form to collect data and it has nothing to do with the main script managing dropdowns. It only explains how other elements can be added to same form. Here is the code to add option to our first list box. Using this function we will collect the value of cat_id of selected category. After getting the value of cat_id we will post it to our PHP script dd.php file by GET method. You can read more on how to post data by GET method using Ajax. Here is the code. Now data is posted to dd.php file. We will collect the data and sanitize the same before using in our query. We expect cat_id to be numeric value. In your case if your are using text then you have to change the sanitization code. You can read more on security and injection attack here. If you are not using integer as cat_id then you can go for alphanumeric characters check by using ctype_alnum function. Replace the function inside if condition checking. We will get subcategory data ( subcat_id and subcategory ) from the table as an array. Same array we will use in Jason format and return to data to main.php. In our main.php file we will receive the Jason formatted data. We will store data in an array variable myarray. 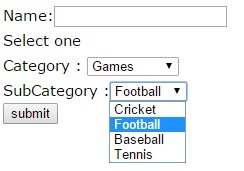 First we will remove if any old option is there in our 2nd drop down list showing subcategory. Now we will add options to our 2nd dropdown list. For this we will loop through the array. Note that the total number of elements present inside the array is stored can be found out by myarray.data.length property. In the above code we have assigned text part and option value part of the 2nd dropdown list to subcategory and subcat_id respectively. If you want you can change this to match your requirement. Once the form is submitted the data assigned to option value only will be carried to next page mainck.php. With this our both dropdown boxes are ready for selection. Once you select first listbox then the cat_id will be transported to dd.php file and matching subcategory name and subcat_id is returned and used in second dropdown list box. You can fill all the data and submit the form to get all values in next page for further processing. New script with multiple selection drop down list box is used. This part is added in your zip file. after selecting item from combobox i.e category, population of data in second combobox is not working. im getting empty small box. I've struggled to integrate this into my website for days - - can someone help me? I believe this works, but just can't get it through my thick skull... Thanks for everything! Thank you for your script. I got it to work but is it possible for the second select option to return both the name and an id from the mysql table ? For example to return information like this <option value='Value ID'>Value Name</option> ? Thank you in advance for your help. Yes , we can use like that and many time we use option and string different data. For that in your sql you can collect both columns and format accordingly. For example we can display student name but keep student ID in option value. "John Smith 1, Joe Black 2,"
this removes everything and keeps the ID, as you can see it's not a good solution. Thanks for pointing out that. I can understand your requirement. The script will be modified accordingly. Give me few hours. thanks, it is fixed now. SQL is correct. The dump file is updated with subcat_id column. Download a fresh copy. Let us know if you are facing any problem. ok how do I populate these dropdowns on an edit window? I am using the three drop downs to add a record, but how do I populate all three when I pull up the records to edit? It's working great ! I will send you a link of my project once I'm done ! Thank you again ! I WILL BE HAPPY TO BE A MEMBER OF THIS FORUM. help me sir, instead of integer in cat_id field, i will use a alphanumeric .. can u give me a edited sample code. thanks a lot! You need to change the data checking part, in place of using is_numeric function use ctype_alnum function. The link is added to the tutorial now. sir, is it possible instead if calling the cat_id in the two table .. i will call directly the value of a category and subcategory by varchar type or in a alpha numeric.. because it is redundant if i add a data in a table like cat_id, bcoz i will add the same value of category in cat_id but its in alphanumeric not int.. reply asap .. thanks! sir, i already change in ctype_num .. but still not work for me .. only in that statement sir ? sorry im new sir in programming and i dont have any experience in debugging .. please help me sir .. i need to finished this part to go to the next part of my project. sir smo, help me please .. The second table is to be changed and we can't keep cat_id to link it to first table. We have to keep category in a column in 2nd table. Then change the query to link both tables through this category. In such case we don't need two tables and we can keep one table only having data of category and subcategory. Please after populating the dropdown, how can i save the LGA name into database since its value takes Numbers. it didnt save to my table.. !! is there any difference on how to insert in pdo and mysql ? anyone help me, thanks in advance..!! There is no difference in query part, it will change in PHP PDO functions. After making selection in category box I only get small subcat box. I haven't changed anything yet, was just testing it out. Am I doing something wrong? It seems you are not getting any output from dd.php. Give some cat_id value at top of the dd.php page and run it to see how data is posted. If you are independently checking the pages then you need this, otherwise just comment this line. I successfully connected to my database and category (=city) and subcategory (=street) are working well. Now I want to use the dynamic dropdowns in Wordpress. Category works and the second dropdown stays empty. Any advice what I have to do to let it work inside Wordpress? Hello, works great except when you select multiple values in the second multiple select drop down list and submit, I don't get ALL of the selected values?? Why did I open dd.php Error message "Error! : could not find driver"
if yes plz help me to do this stuff. What is the version of your PHP, do you have PDO support ? Check this PDO installation guide.